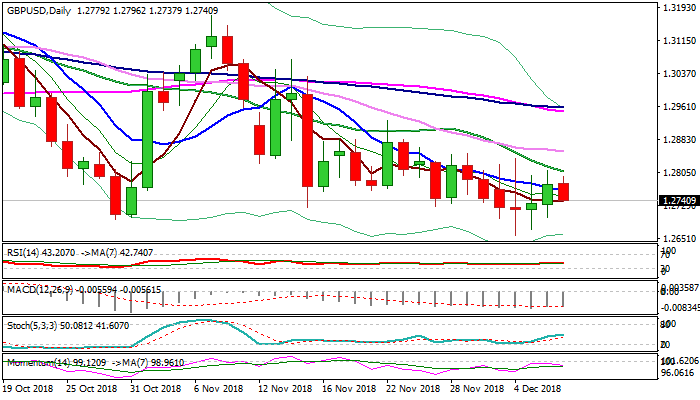 Cable stands at the back foot in early Friday’s trading and eases back to 1.2750 zone, following bullish close on Thursday which generated initial positive signals after the action on Tue/Wed ended in long-legged Dojis. Thursday’s spike above 1.28 handle was again capped by falling 20SMA and marginal close above Fibo barrier at 1.2764 (61.8% of 1.2849/1.2658) was so far insufficient to produce stronger thrust for further recovery. Weakening momentum on daily chart and MA’s in negative setup maintain negative tone for renewed attack at 1.2661 (2018 low) cracked on Tuesday’s spike to 1.2658. Initial support lays at 1.2731 (broken Fibo 38.2% of 1.2849/1.2658), guarding Thursday’s low at 1.2699, loss of which would open way towards key 1.2661/58 levels. Sustained break below 1.2661/58 triggers will be very bearish. Bullish scenario sees close above 1.2800 barrier as minimum requirement to signal recovery, with lift above 1.2850 needed to confirm. US jobs report is expected to provide fresh signals, but focus turns towards the final event of the historical week – UK parliament’s vote on Brexit plan, which would provide key direction signals.